The Sony Xperia Z1 Compact is the little brother of the Xperia Z1, that comes with much of the same specs, and also it seems much of the same price, too. 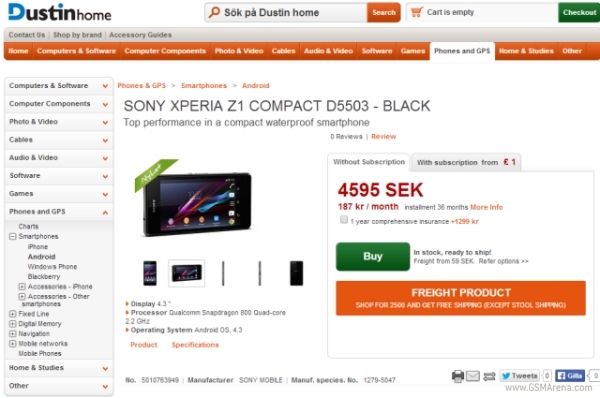 A new leak points to the Xperia Z1 Compact costing about €520 in Europe (SEK 4,595 in Sweden), which is about the same price for the bigger brother and slightly older Xperia Z1, too, depending where you look. The Xperia Z1 Compact will come with a 4.3″ screen, 720p resolution, Qualcomm Snapdragon 800 processor, 2GB of RAM, 20.7MP camera, and 2MP front-camera. Unfortunately, just like the recently leaked colorful HTC Desire, it will arrive with only Android 4.3 on board, which I find a major disappointment, since I believe no phone launched in 2014 should have anything older than KitKat. Otherwise, Sony has been doing pretty well lately in terms of the specs they’ve been using for their phones and overall quality of their devices. I expect them to have an even better year in 2014, especially if they prepare a big launch in US (although it will probably take a while for Americans to get accustomed to Sony’s phones, and start buying them by the millions). If they make this year’s Nexus, that could really help them get all the media attention they need in US, and then it should be much easier to sell their own phones there, going into 2015.